A wide-ranging trade agreement between 11 Pacific Rim countries is on track to take effect before the end of 2018, following formal notice of Canada’s ratification last Saturday and indications from Australia that it will do the same this week. 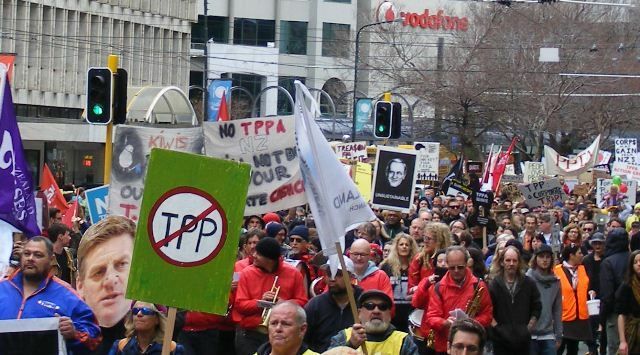 The Comprehensive and Progressive Trans-Pacific Partnership — a revised version of the 12-country Trans-Pacific Partnership (TPP) deal struck following the withdrawal of the United States — can take effect 60 days after at least six of the 11 partner countries file their notices of ratification with New Zealand, which acts as the depository country overseeing the deal’s implementation. On Monday, International Trade Diversification Minister Jim Carr invited cameras to the New Zealand High Commission for a photo op with High Commissioner Daniel Mellsop to mark Canada’s filing over the weekend. Canadian senators voted Thursday to approve Canada’s implementation legislation, clearing the way for a fast royal assent and the conclusion of Canada’s ratification process by the federal cabinet. Carr said Monday the legislation had moved "as fast as any bill at any time because it’s so important for Canada to be a part of this great agreement." Japan, Mexico, New Zealand and Singapore all ratified before Canada. Eyes now turn to Australia, which is expected to be the sixth country to ratify. Australian legislators already have voted in favour. According to a report from Bloomberg, Australian Trade Minister Simon Birmingham said last week in Ottawa his country was on track to give its formal notice by this Thursday, Nov.1. There’s an economic incentive to have six countries on board by that date. Some of the CPTPP’s tariff cuts are immediate, but others — particularly for the most sensitive agricultural and automotive products — ramp up over timelines of a decade or more. The CPTPP is now on track to be in effect before the end of the 2018 calendar year. That means the initial tariff reductions would kick in by Dec. 31. But according to the CPTPP’s tariff schedules, reductions for subsequent years kick in on Jan.1. So a second tariff cut could come almost immediately after the first — on Jan.1, 2019. Without six partner countries ratifying the deal this week, the second wave of tariff cuts would have to wait an entire year, until Jan.1, 2020. It’s difficult to say exactly what economic impact the CPTPP will have on Canada’s economy. Canada already enjoys preferential trade with some countries in the deal thanks to existing trade agreements (its bilateral trade agreement with Chile, for example, or its NAFTA partnership with Mexico). According to recent Canadian government calculations, once the TPP is fully implemented (and all the tariff cuts are in place), Canadian exporters could save $428 million per year, with the bulk of the savings coming from exports to Japan ($338 million), Australia ($47 million) and Vietnam ($25 million). Because Canada has had no success in negotiating a bilateral trade agreement with Japan, access to its large but often protected market is arguably Canada’s best reason to participate in the CPTPP. The remaining five countries that signed the CPTPP, but are not expected to ratify in time for the deal’s initial implementation, are Brunei, Chile, Malaysia, Peru and Vietnam. Vietnam’s government has suggested it may ratify the CPTPP in November.